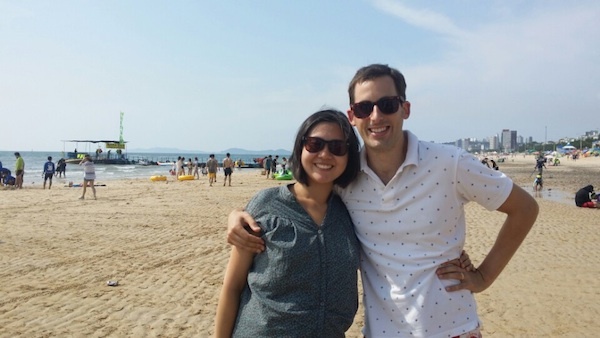 Arrived at the beach (Boryeong). One of our new year resolutions was to visit the sea this summer. However, it didn’t seem to work out and as the weather turned cold already in the Netherlands I didn’t think it would happen. So I was delighted to visit the sea in Korea! Since the end of the summer season was also approaching here, family was worried that I wanted to swim, but to my surprise the sea was warmer then I’m used to. This Boryeong beach is famous for an annual mud festival. The place is buzzling with small dining ventures and mud therapy centers. And actually, I wasn’t the only one in the water; The people in the water came to swim or hang out on their inflatable boats. However NOT to get a tan on the beach as you see in Europe. After swimming we ate ‘Whe”, thinly sliced raw fish and other raw seafood (similar to Japanese sashimi); This restaurant was based right outside the port, full with small fisher vessels. Based on the first floor of the building, we had a great view over the harbor. Whilst getting used to eating while sitting on the floor, the Soju was welcomed with these raw foods. (Korean rice liquor) The food wasn’t cheap but it was quite an experience. 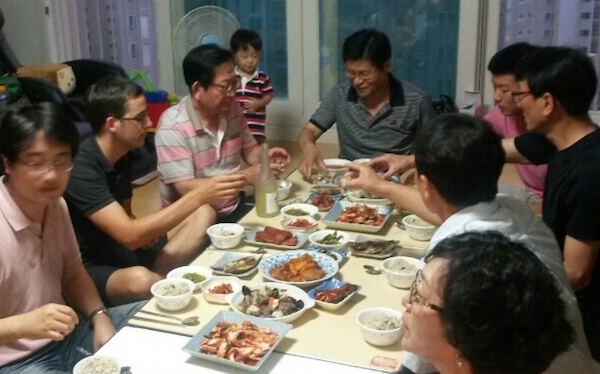 Having a Chuseok dinner with the family. Felt part the group regardless of limited Korean. 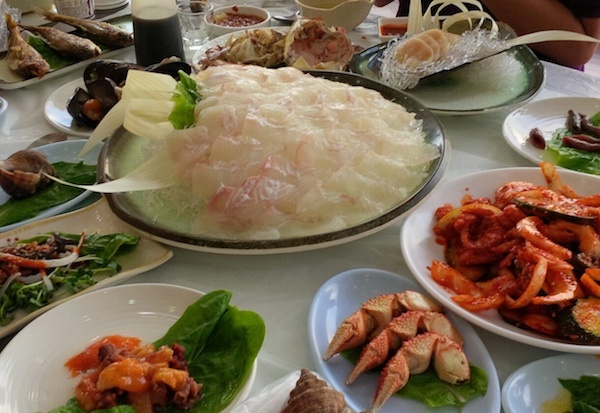 Another marker of the end of the summer were the Chuseok preparations, which is a celebration of the good harvest, Koreans visit their ancestral hometowns and share a feast of Korean traditional food such as songpyeon and rice wines such as sindoju and dongdongju. It’s a typical time to meetup with the family. Unfortunately I had to travel back to the Netherlands for the real ceremony but I was happy to join the mother’s side of the family for a great dinner. A bit intimate photo but I really enjoyed this authentic experience. You can see me sharing a drink with my uncle’s. In Korea, if you ask a barista for a ‘Dutch Coffee’ you get cold coffee with ice cubes. The chemical lab looking device (photo) works like this: You add a liter of ice water in the top level water container, followed by about 100 grams of grounded coffee in the compartment below, then simply let’s it run and wait for about 6 hours. 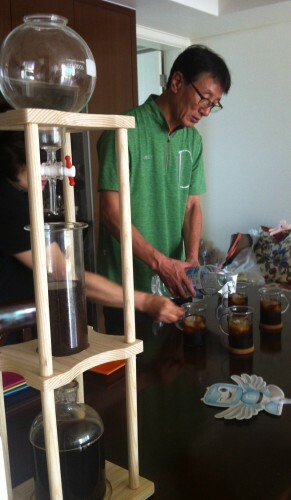 The ceramic or paper filter starts dripping and you store the dutch coffee in the fridge. Really refreshing! Whilst I saw this device for the first time in 2012, I was able to order Dutch coffee in most Korean coffee places, and even in Shanghai. Read more in my blogpost from 2012 regarding this coffee. Korea is such a dynamic place which gives me a lot of energy. Yesterday I meetup with Kakao. Their Kakaotalk messenger is the ‘Whatsapp/wechat’ of Korea, and outside. They have 140 million visitors, it’s great technology of which a lot can be learned. Very exciting to see their office from the inside and have a peek into this technology company; It shows that Korea harbors modern and cutting edge technology companies these days. See more pictures from their office here. Besides Kakao, I also had the pleasure to meet Sun Hyun Woo. Hyunwoo Sun is a YouTube star and the best Korean language teacher in the world. Period. Together with the team he built he has a community of over 110.000 Korean learners (200k facebook likes) around the world. If you are interested in Korea and the Korean language there is no way not to find Hyunwoo Sun’s free lessons on http://talktomeinkorean.com. Since talktomeinkorean and eatyourkimchi.com started a cafe (named you are here cafe) in Hongdae, we couldn’t resist to have a look and meet the people behind this concepts. It was a short trip. Almost forgot to eat some Korean barbeque. 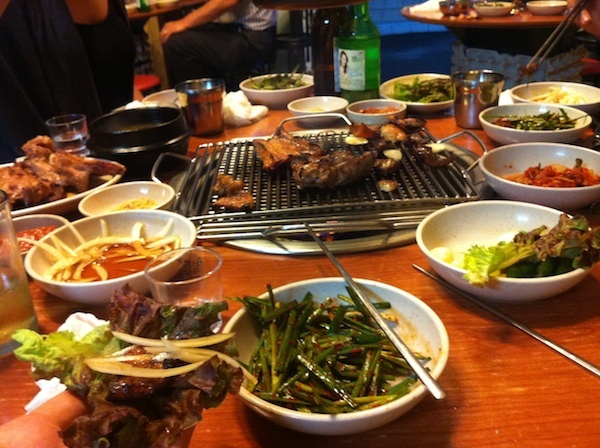 Actually, Korean food is about way much more then barbeque. But who can say no to such a dinner before leaving back home?